Every few months, we pack up the dogs and head out on a roadtrip to Rochester, NY. It’s not a bad drive – about 2 hours – and it’s home to one of our favorite salvage shops, Historic Houseparts. This past weekend, in our search for old oak flooring, we inevitably decided to check what Historic Houseparts had in stock (and wander through 14,000 sq. ft. full of goodies) – so we headed west. Unfortunately, they didn’t have the wood we needed. But all was not lost. The guy helping us dig through trim and molding was kind enough to let us know that they had new competition not too far away – ReHouse. We were thrilled to hear about a new salvage source, and the excitement did not end there. 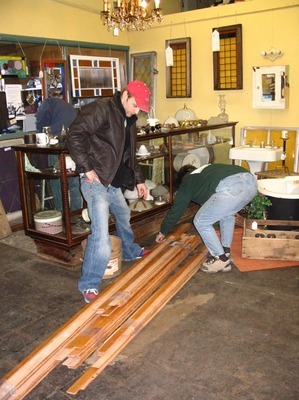 When we got to ReHouse, we found the flooring we so desperately needed at a very good price. Miracle of miracles – for once, the materials cost LESS than we were planning to spend! ReHouse had an interesting inventory of salvage supplies – some old, some newer, all priced well and easy to sort through. They also had antiques and vintage items sprinkled throughout the store, which made it fun to explore. Their website mentions auction opportunities, where you can bid on items within a (soon to be bulldozed) house and then take them out yourself. This excites me most of all – I imagine we’d meet some interesting people at an auction like that. We were so happy with our finds, we actually high-fived each other on the way out of Rochester. Hurray! What a great find and a new source for future great finds. I need to google and find the closest salvage shop to us. There’s nothing in our town or the adjacent town, but there might be something SOMEWHERE in the state, right? Nice find on the trim fellow Top Tener :-). I love the Historic House Parts web site. It has been one of my favorites for years. I have to cover the keyboard with a towel to catch the drool when ever I go there. They seem pricey for their stuff, though. Is it any cheaper in the store? Greg – The brick-and-mortar store is pretty pricey too – for both new and salvaged stuff. That’s why I was armed with the credit card and expecting to spend so much more. They have two very large warehouse areas and two-story store full of GOOD stuff, and there’s always someone around to help you find what you need. I imagine that’s why they have to charge a bit more than other places. It’s the perfect place for people without the time/energy to search for better deals. Or when you you’re looking for something specific and are willing to pay a little more for it. We bought our french doors from them and were thrilled with the purchase. They had so many to choose from, it was overwhelming in a good way. Lots of drool and whatnot. Kristin – I would definitely Google it. They’re so much fun to wander around. I would never have guessed how many we have nearby. We actually have 4 within driving distance, one of which we’ve yet to see. You must have something! Hey Aunt Sue – thanks for the heads up, I hadn’t seen that. I love that library, they have a great selection for such a small town. I’ll have to check into that! And yes, I had a blast visiting mom and dad – they make me want to be retired!